Providing regular maintenance checks or inspecting your gutter system can help you prevent and avoid many problems. Gutters are essential to the home in diverting rain water away from the roof, walls, and foundation of the home. We are a licensed and insured gutter company offering our services in your area and surrounding cities. 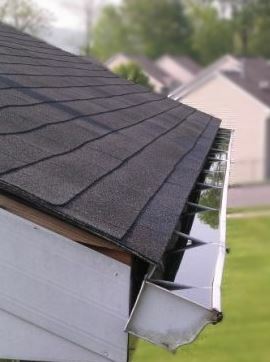 If you have been looking for gutter repair service, then you have come to the best place in Mishawaka, IN. We can give you a free quote on gutter maintenance costs. You may contact Michiana Gutter Pros by filling out the short form on our site or just give us a call. We have an expert team of techs that have been extensively trained in the gutter repair and replacement field. Our company can supply client with a gutter maintenance guide to help them know when their gutters need servicing. Roof gutter maintenance is just as important as the downspout maintenance. Our sheer flow gutter filter installation and regular gutter maintenance services come at a great low price and all repair service are guaranteed. By choosing to have regular gutter maintenance you will be providing protection for your home, your investment. If you have questions or concerns, we will be happy to answer them for you. We love to help our clients understand about gutter systems sand how they will benefit from having them work correctly. We can clean your gutters to save you much valuable time. Our company is easy to locate in the online business directory if you are referring our services to family and friends. Having clean gutters without any leaks will allow the water to run freely through them. When gutters are clogged it can cause many problems around the home like water puddles, insects, damage to roof, foundation and walls. You do not want this costly problem to occur with your home. We are reliable, trusting and honest. No other gutter company in the areas can beat our great low prices along with our guarantee. Our gutter systems are durable and made to stand the harsh weather conditions. We are available to offer our gutter maintenance services all throughout the year. If you have been looking to update your gutter system, then you will certainly some time and money by allowing us to do the job. Gutters are made from a few different types of material like steel or durable plastic and more. You may even choose the gutter system in different colors. You can be creative by designing a rain garden near the downspouts. DIY gutter repair may be a bit time consuming if you are not skilled. Gutters make the home have a neat and attractive appearance to. Gutter can increase the value of your home. We can tell you just what type of repairs your gutters will need. After your gutter system becomes really old, cracks and chips from the normal wear and tear can cause leaks. If the leaks are not fixed, they will only become worse over time.